The idea of having a camping event was mooted many months ago when we were in Ipoh giving a talk on homeschooling, hosted by husband and wife team Intan and Harith When they revealed that they could also get Dato Lat to give an informal session on cartooning to the kids, we were naturally excited! And so the months went by with the idea tucked behind our minds as we busied ourselves with a hundred other things, and then, out of the blue, the idea resurfaced but this time, it was for real! We would like to put the record straight: the REAL people behind this are Intan and Harith – THEY were the ones working hard behind the scene to get everything in order for us to enjoy. So a BIG THANK YOU to the both of you! RIBUAN TERIMA KASIH! Most of us were camping for the very first time. Some children expected the place to be wild and untamed (thanks to their fertile imagination from story books!) and came prepared for a rough ride. Sorry for the disappointment. Instead we were greeted by a clean and secure holiday resort, with cool activities like biking, kayaking, swimming, treasure-hunting and amazing-racing! The kids quickly forgot their “disappointment” and quickly dived into the outdoor activities! The designated camping site was designated at the lakeside – perfect spot for taking in the sight and smell of the beautiful lake, except for the noticeably dark and threatening clouds that descended upon the campsite not long after the tents which were strenuously and meticulously set-up by each family. Great job everyone! The storm clouds played hide-and-seek with us. One moment they were hovering menacingly above us, and the next moment, they were blown away by the strong winds. So it was a tough decision: do we let the tents stay put or do we move them all into the covered tennis court area? In the end, the rain decided for us. They fell by the buckets! But luckily we had the ever efficient and helpful camping guides to do the tough job of shifting the tents for us. This was when we were grateful that we did not choose the wild jungles for our first camping trip! THANK YOU CAMPING GUIDES! All was not lost as we were fortunate to be placed right next to a huge indoor tennis arena equipped with a 200 sitting capacity area, lighting and most importantly, clean toilets. Perfect venue for our ad hoc kids’ performances which ranged from flying demonstration (of the super heroes kind), to rap-singing (can’t really tell which was which), and a yoga demonstration (of the spine-bending kind!). The kids played game called “Tie the Mummy” where each team was given a toilet roll with which they turned a team mate into a scary mummy! It was great fun especially when some kids came all dressed in scary/funny/strange Halloween costume! (A Batman was seen throwing tennis balls with his Wacky Monster dad!). All hell broke loose when Uncle KV (who hosted the evening show) announced that it was time to play the game that everyone was waiting for: TAG! And so all creatures great or small, ghosts and humans (and in-betweens) ran helter skelter around the courts. Everyone had a helluva fun on this halloween night! Another note of thanks to Intan & Harris for providing the party smacks and food gifts in the forms of chocolates, biscuits and lots of peanut/raisin cocktails! YUMMY! The sleepy heads were the first to crawl into their tents to call it a day – first prize goes to the Chan family! For the rest of the night owls, the night was still young! A trophy for Uncle KV for successfully starting the campfire for the the eager kids to barbecue their preciously delicious marshmallows! Seeing them done in books is never the same as doing it yourself! The more adventurous adults moved their tents outside for a more authentic experience of camping under the star-lit skies. Only thing was, there weren’t any starts that night. But who cares? It was still real camping under the night skies compared to the less adventurous who chose to stay indoors under the concrete ceiling! The adventurous families get a prize for throwing caution to the wind! It must have been an experience to be remembered for a long time to come, I’m sure. I can only imagine it for I was one of the indoor campers! Everyone woke up with great excitement – Dato Lat was coming! For that, we were willing to forgive the super early risers who got up at an unearthly hour to hit a couple of shuttlecocks! Sorry no prize for you guys:( But everyone was amply rewarded by the rare presence of Dato Lat, who came unescorted, to give an interesting slide presentation of his childhood. One could see that every child and every adult in the room was rapt in attention, listening to his amusing childhood stories of “naughty adventures”. He spoke lovingly about his kampung house and his kampung life, playing various games with his kampung friends. It was a stroll down the nostalgic road for many of us, even though not many could attest to having lived in a kampung before! But who amongst us hadn’t read Lat’s books as a child? Now we were exposing our kids to the genius of a kampung boy who made it big with his humble but enormous talents. 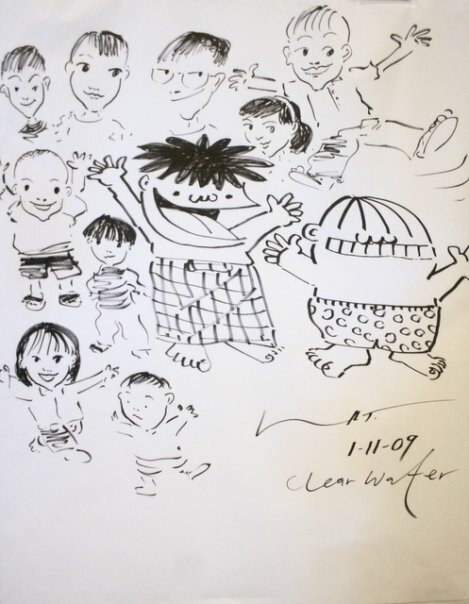 Dato Lat touched every single kid that day, including those of us who are kids at heart, with his sketches of hope and joy, of possibilities and dreams come true. In fact, he did more than that, as he went down to the level of the children, to sit with them, viewing their sketches and giving them his invaluable advice and encouragement, and personally imprinting on them his Lat trademark signatures. His rapport with the children was excellent! And a young lad from Penang came all the way here, to present Dato Lat with a special haiku! Lat was visibly touched! After going from table to table for signing and picture-taking, Dato Lat had a short sketching session with the children. He sketched the children’s faces on the spot! This created a lot of enthusiasm and excitement amongst the children, who were delighted to see their pictures come to life on paper! One could tell that Dato Lat was having a good time too! A group photo shot with Dato Lat was a perfect ending to a perfect event! We hope those who came had a memorable weekend with us. It was a relatively stress-free event for us and we have Intan and Harith to thank for doing all the hard work for us:) We definitely look forward to more future events here in idyllic Batu Gajah! 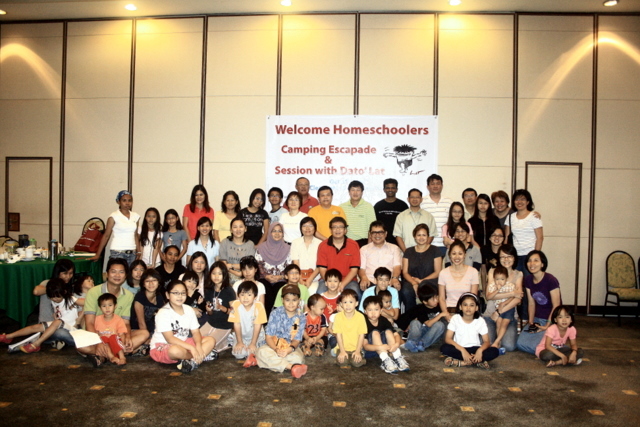 Parents got to network and exchange experiences on homeschooling, and the kids got a chance to make new friends. What more can we ask for? Thanks Wai Leng for the lovely write-up! I have forwarded your report to Dato Lat (hope you don’t mind)…………Harith had lunch with him yesterday and asked for a feedback on the session. Dato Lat said he really enjoyed spending time with the kids and said the they were very bright and smart. Just for your info, Harith and I were very surprised he spent some time at each table to interact with kids and sign autographs and the sketching of the young participants at the end was the BIGGEST surprise, because he has NOT done this in a very LOOOOOOOONG time. That was priceless! Dato Lat has requested for copies of the photographs taken that day. So those who DID take snapshots on that day (Tiger, Aloysius, Radzif/Rosna, Pei Fern etc etc etc) could I humbly request that you email me the snapshots. Harith and I would like to compile them in an album and present it to him. PRETTY PLEASE!!! We shall look forward to more gatherings like this in the near future. This was so much fun! This entry was posted in Activities, Outings and Networking Activities, Seminars, Conference Dialogues & Talks and tagged camping, Clear Water, Dato Lat, homeschool escapade, LAT. Bookmark the permalink.